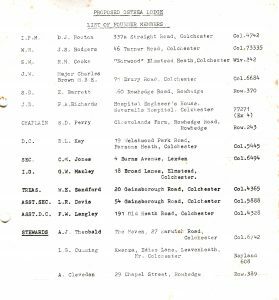 Early in 1967, a few members of our mother lodge, Colne Lodge Nº2477, started with an idea of forming a second lodge in Wivenhoe. A committee was formed and, under the guidance and direction of W.Bro. John Rodgers the wheels were set in motion which would result in the formation of the Ostrea Lodge Nº8209. At the meeting on 11th March 1968, W.Bro. Rodgers was pleased to present, to the brethren, a box of Working Tools which had been presented to the Lodge by W.Bro. Bernard Kay. This box and the Working Tools are still used by the Lodge at every meeting. It was also reported that “W.Bro. Charles Ashley was engaged in making other tools for use, in the new lodge, and the Worshipful Master had made the required number of wooden gavels”. The gavels are used at every regular meeting.